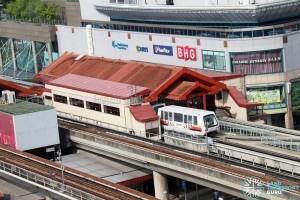 The Bukit Panjang Light Rail Transit (BPLRT) is a light rail line serving residential estates within Choa Chu Kang and Bukit Panjang. 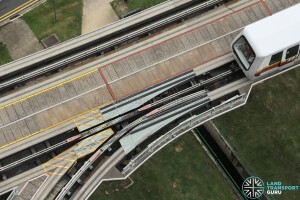 The 7.8-kilometre network is the first driverless and fully automated train system in Singapore. Opened on 6 November 1999, the line operates on the Bombardier Innovia APM 100 rolling stock, which are rubber-tyred automated people movers operating in single-car and double-car arrangements. Unlike other train lines in Singapore, the Bukit Panjang LRT using Service Letters to indicate its direction of travel and destination. 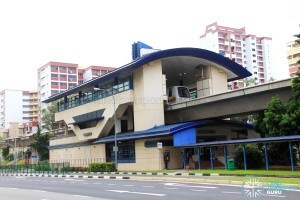 This is due to the unique, non-linear shape of the line, which branches out at Bukit Panjang Station. Trains travelling from Choa Chu Kang will split directions at Bukit Panjang station, making either a clockwise or anti-clockwise loop before returning to Bukit Panjang station. 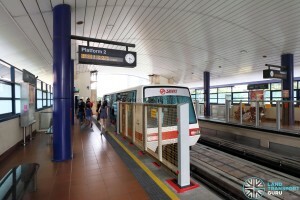 The Bukit Panjang LRT was developed to extend the reach of the MRT network closer to residents with stations situated within the Choa Chu Kang and Bukit Panjang neighbourhood, connecting to the heavy-rail North South Line and Downtown Lines. 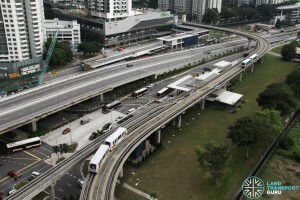 It also complements existing trunk and feeder bus services within the two estates. The BPLRT will end earlier at 11:30pm daily to facilitate renewal works from 13 January 2019. Bus Services 920, 922, 973 & 974 are extended to about 1:00am to support the change in operating hours. The BPLRT operates with two routes, namely Service A and B. 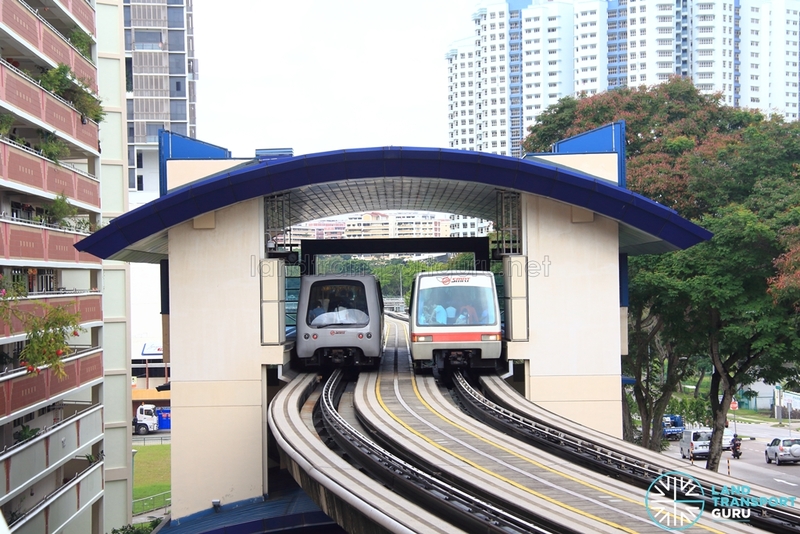 Both Services A and B start from Choa Chu Kang, and upon reaching Bukit Panjang station, Service A will travel around Bukit Panjang estate in a clockwise fashion via Senja station, while Service B travels the counter-clockwise loop via Petir station. Both will meet up and Bukit Panjang and continue towards Choa Chu Kang where they terminate. 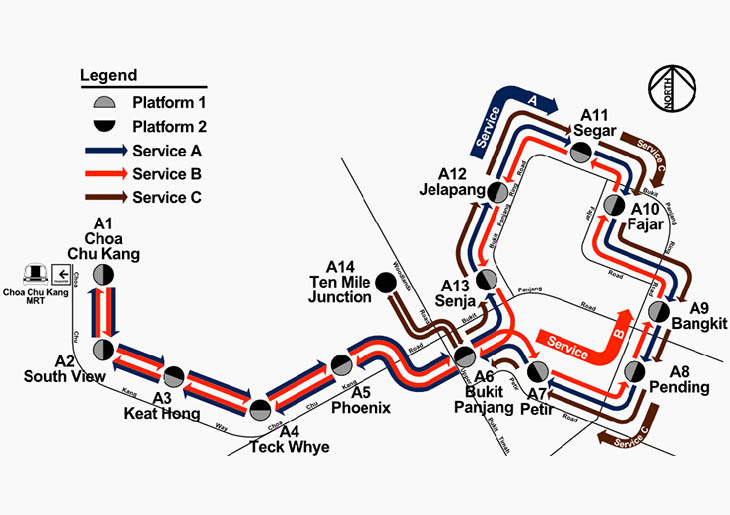 Service C was a supplementary service that started and ended at Ten Mile Junction station via the Bukit Panjang loop. 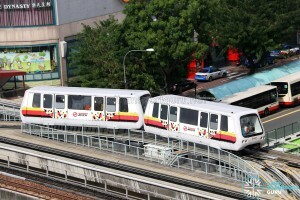 It operated every 20 minutes, and looped within the Bukit Panjang estate in a clockwise direction similar to Service A. Service C operated between 10.00am and 11.10pm daily. It suspended operations between 4.15pm and 9.15pm on Weekdays, and operated continuously on Weekends and Public Holidays. Service C was discontinued, along with the permanent closure of Ten Mile Junction station on 13 January 2019 as part of the revised BPLRT operating hours for the BPLRT Overhaul works. Diagram of LRT services A, B and C. The station codes have since been changed. 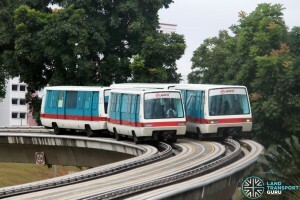 The Bukit Panjang LRT operates on the Bombardier Innovia APM 100 rolling stock. An initial 19 trainsets were delivered in 1999 under Contract 801, which bear a turquoise livery. 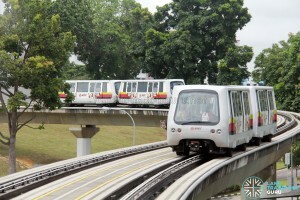 An additional 13 trainsets were delivered in 2014 under Contract 801A, bearing SMRT’s pixel livery and a slightly different exterior design. These trains, also known as automated people movers, are rubber-tyred for minimised operating noise within built-up areas and guided by a central guideway which also contains a power rail. They operate in both single-car and double-car arrangements, paired with a similar model (C801 and C801A trainsets are not cross-coupled). 19 Bombardier Innovia APM 300 trains have been procured under Contract 801B as part of the Bukit Panjang LRT Overhaul. These trains will be equipped with Communications Based Train Control (CBTC) signalling system and will replace the first generation Contract 801 trains. 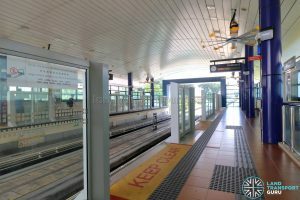 In 2018, all stations along the Bukit Panjang LRT were completely fitted with fixed, half-height platform barriers in an effort to improve commuter safety. Choa Chu Kang and Bukit Panjang stations were the first to be installed with these barriers in 2015, in anticipation of higher commuter traffic with the opening of Downtown Line 2. 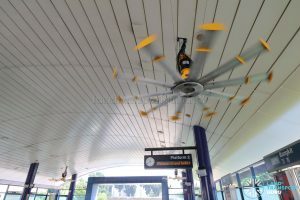 In addition, ceiling fans were installed to keep commuters cool at platforms. An overhaul of the Bukit Panjang Light Rail Transit (BPLRT) Line was awarded to Bombardier (Singapore) for S$344.25 million on 7 March 2018. The contract covers new trains, power rails, signalling system and various other critical components to renew the ageing LRT system, which has been in operation since 1999 and is reaching the end of its useful life. Bombardier, who is the Original Equipment Manufacturer (OEM) of the Innovia APM system deployed on the BPLRT, demonstrated that it would be able to renew the line with minimal disruption to existing services. The company is highly familiar with the current system, having gained experience from ongoing reliability improvement works carried out since 2016. It also promised a shorter completion timeline for renewal work, as compared to other suppliers. Renewal work began in the first half of 2018 and is expected to be completed in 2024. As part of the overhaul works, Ten Mile Junction station is slated to be closed from 13 January 2019 to provide LTA and Bombardier with additional space to conduct the renewal work of the BPLRT system. 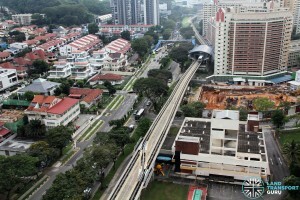 Check out the main article: Bukit Panjang LRT Overhaul for more information.